Forty-six international fellows shared to Cebu-based teachers their best practices on how to effectively teach the English subject to students across different ages. 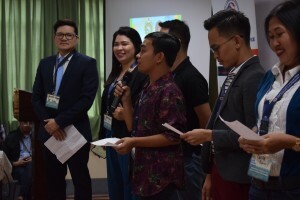 Dubbed as “English fellows” by the US Embassy, the said resource speakers were brought to the Philippines by the Regional English Language Office (RELO) of the US State Government for them to share their knowledge and experiences. Among the fellows who came were from China, Korea, and different parts of Southeast Asia according to Dr. Glenn Pajares, dean of the College of Arts and Sciences (CAS). The event was entitled “International Conference for English-Teaching Professionals”. It was held at the University of San Jose-Recoletos (USJ-R) last January 31 to February 1. Over a hundred participants from 30 different Cebu schools joined the conference. They were from Arcanys Early Learning Foundation, Ateneo de Cebu-Sacred Heart School, Barrio Luz National High School, Boljoon National High School, Bright Academy, Cebu Technological University-Moalboal, City Central High School, City Central Elementary School, Cordova Catholic Cooperative School, Don Gorordo Ouano Night High School, Gothong Memorial National High School, Noble Minds Christian Academy, Philippine National Science High School, Sacred Heart School – Hijas de Jesus, San Agustin National high School, Santa Fe National High School, Science Technology Education, Sisters of Mary Girlstown, University of Eastern Philippines, university of the Philippines – Cebu, University of the Philippines – Cebu Master Education Program, and Zapatera National High School. USJ-R also picked faculty members from the grade school, junior high school, senior high school, College of Education, and the Department of Languages and Literature to join the activity. Harold Samuels of RELO expressed that he is impressed with the turnout of the conference. “I was so impressed that so many schools sent their teachers. That was really wonderful and that’s how we can really multiply the effect of a conference like this. The more schools that participate, the better,” he said. UP Cebu participants of the International Conference for English-Teaching Professionals deliver an original poem to thank both the organizers and their fellow participants. RELO partnered with USJ-R and UP-Cebu to organize the said activity. “This is a first in Cebu. This is a workshop by English fellows of the US Embassy. The sharing of experiences may actually have opened new horizons and perspectives of the teachers ,” said Pajares. He added that the event was also an avenue to establish linkages and network with fellow teachers not just in Cebu but in the global community as well. Dr. Aurelio Vilbar of UP-Cebu highlighted that he appreciated the strategies shared by the resource speakers to make students ‘talk more rather than fear more’. “With the US Embassy and USJ-R, I feel that this conference is full of sharing and compassion to make education work,” he remarked. To end the two-day event, UP-Cebu participants of the deliver a Tanaga to thank both the organizers and their fellow participants. Tanaga is a poem composed of five lines with seven syllables. Samuels said that their mission is to help the teachers of English in all levels through training and having them participate in conferences. “We hope that all of the teachers who attended the conference will share widely with all of their colleagues at their respective schools and also in the community to multiply the effect,” he expressed.